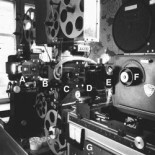 This piece was written for IS432:Issues in Heritage Preservation, an Information Studies class with content crucial for the satisfying of course requirements of the Moving Image Archive Studies program at UCLA, taught by Professor Snowden Becker in the Spring of 2012. In addition to the general focus upon the rhetoric of preserving important cultural materials, this class also strongly examined the complex ways in which specific materials interacted with their environments, explored a variety of strategies to deal with these interactions and emphasized the crucial value of needs-assessment and evaluative engagement on collections that contain more than purely moving image materials. My work here located comic book materials and surveyed them within a larger population, placing them within a historical context and modernizing their current historical preservation timeline in addition to individuated collectors. What does it mean to be a comic book fan today? Alternately accused of rampant juvenile delinquency by the likes of Fredric Wertham or exalted by the moving image materials of “geeks-gone-Hollywood” like Kevin Smith and Jon Favreau, the identity of comic book fans has managed to find itself neatly balanced somewhere between cultural jetsetter and Neanderthal. It may have taken many years to get to this point, but what once appeared to be a subculture of “weirdos” to the outward universe is now the population being relied upon for generations of (sub)cultural heritage materials. Whether or not America at large considers Robert Crumb a national treasure, he has now had multiple exhibits in highly respected museums and a feature-length film while Jack Kirby’s superheroes have flown through different galleries of the United States, gaining admiration and praise (in addition to enough publicity to base several films on his characters). While comic books may have made it beyond the newspaper racks to being primary texts in university classrooms, the comic book community itself has still been kept at arm’s length. They remain the “out group” in a very “in subject.” Even Kevin Smith’s television show, Comic Book Men, designed to platform comic book culture and collectors has only served as fodder for the “normals.” On the other hand, despite this social strata reification, there is most certainly something unusual that has been brought to light about the comic book fan community: they are the preservationists. Whether or not the images being displayed of the comic book community are positive, it has become clear that these are the figures that are helping to preserve the materials. The relationship of a consumer to the product cannot be underestimated when it comes to fandom, and even more so when it comes to collection, most notably, to preservation. In a recent survey conducted by the author, 61 people answered questions about comic books and their personal relationship to them. Out of this population, 39.3% had been collecting for 20 years or more, putting them in a group spanning not only decades of characters and storylines, but formats and their consumption. While the majority of the collections surveyed were made up of comics from 1970 forward (93.8% of those asked reported materials primarily from the Bronze and Modern Age of comics), the preservation methods seemed to be consistent for all involved constituents. Collecting is a fastidious hobby and one that comes with many rules and bylines, almost all associated with age and condition of collected object. Those who answered the survey were people who had clearly been in the community for long enough to have sorted out the methods and ways that worked best for them, periodically changing them based upon new standards of publishing or what they saw as better ways of keeping their items in an accessible state. Within this survey, it is essential to recognize three things about the surveyed population: 1) these individuals are consumers who are educated about the product that they are reporting on, 2) they are dedicated to their pursuit no matter how casual a fan or collector they may purport themselves to be and 3) their loyalty to their habits is strong enough to lead them to report these inclinations to a larger body (the author’s survey). None of these things should be underestimated. Thus the denial of the “collector” label becomes more curious upon reading engaged descriptions of housing their own comics in “Mylar, not polyvinyl. Micropore sheet to absorb offgasses. [sic]” and their trade-paperback/graphic novels in “bags” (meaning the traditionally used preservation quality Mylar bags mentioned in the previous individual’s response). Not only that, but they mention very clear ways in which the physical properties of comics and trades have changed over the years, an aspect that only someone with a collector-type mindset would see. 89.1% said that the paper had changed significantly, 76.1% said that the ink had changed quite a bit and 47.8% commented on the state of the binding. While 61 people may not be a very large group to survey, it is indicative of the larger trend of comic book fans and collectors today. The responses that were culled were knowledgeable and forthright about the state of the comic book world as it stands right now. Of interest, there was little to no mention of digital comic book reading or collecting. This means that there is still a market for the tangible materiality of the comic book. While consumer culture is still alive, the concept of the comic book fan will be too. The careful collecting aspect (bag and board, Mylar, etc.) is still attractive to people. The great aspect of this is, they are protecting the future of comic books and that aspect of cultural heritage, whether they know it or not. Little did he know that this “collecting craze” would end up being one of the very reasons that people are still able to read and enjoy the comic books that he wrote, drew and edited back in the early 1950’s. While EC Comics had started off as Educational Comics, a small company that specialized primarily in bible, science and history-themed comics, it was shortly after founder Max Gaines’ death in 1947 that it blossomed. William (“Bill”) Gaines, the prodigal son returned to the fold and took over the family business, grabbing the small label and flipping it on its head. What was previously Educational Comics became Entertaining Comics, and focused initially on war and suspense titles, gradually moving on into stories of science fiction, horror and the fantastic. 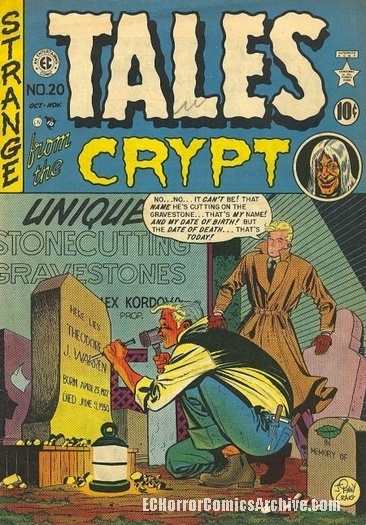 Editors Al Feldstein and Harvey Kurtzman assisted in the creation of the EC Comics world, lifting stories from people like Ray Bradbury (eventually credited and paid) and giving artists like Jack Davis, Frank Frazetta, Wally Wood and “Ghastly” Graham Ingels their first shot at the big time. Between 1950 and 1956, EC published 25 different titles before folding and turning over the reigns to MAD Magazine. Their product had been affected greatly over the years due to political issues. So much so that they had ended the runs of several of their most popular series such as Vault of Horror, Haunt of Fear, and Tales from The Crypt in 1954 after coming under severe attacks from Senator Estes Kefauver during the Congressional subcommittee hearings. While Gaines had attempted to replace the popular titles with others (the “New Direction” series followed by the “Pictofiction” line) none were as popular as the initial runs. 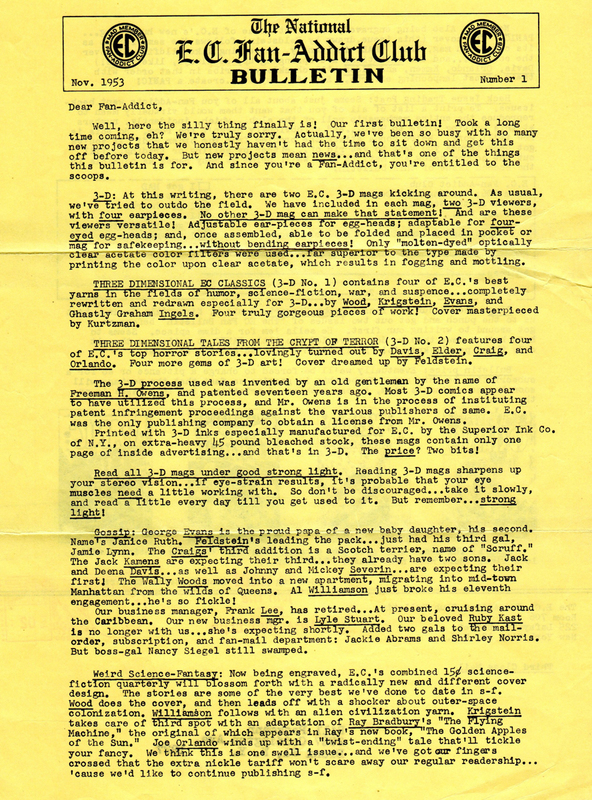 Gaines admitted defeat; the last non-MAD publication was printed in 1956, and EC slowly transitioned into a one-publication house. But EC Comics did not die a quiet death. Not these “funny books,” drenched in tales of blood-soaked zombies and revenge on the outer-limits. Much like the words of Dr. Frankenstein when the Monster is discovered to have risen, this group of books was alive. As far as the physical comic book elements went, founder Bill Gaines was in possession of all primary materials. He kept all the original art with the exception of “a single Frank Frazetta cover that Frank couldn’t part with, because it was one of his favorite drawings…every other original drawing Bill kept.” (Feldstein 2010) While Gaines may have set the ball rolling, it was not he who took it the extra step towards preservation of the materials, reproductions or reprints. Ballantine Books did a series of reprints (all in black and white with color covers) about 10 years after the last comic had gone through the presses. While the Ballantine collections are known to be the first republications, there was no comparison between the work that was done on those and the work that was done on the next series of republications. What happened then was unprecedented, much like the history of EC Comics itself. One of the most important things to note about EC’s preservation history is that the preservation of EC Comics stems from its multiplicity of reprints, all of which were originally spawned from its loyal fanbase. This fanbase, something that Bill Gaines had worked hard to nurture during the highpoint of the EC years, returned the favor by putting the time back in on the materials in order to create an archival library that is still being celebrated and published in new manners today. From this fan culture were born the individuals who became responsible for the evolution of EC Comics into what it is today, a library with archival materials, several different printings and more to come. 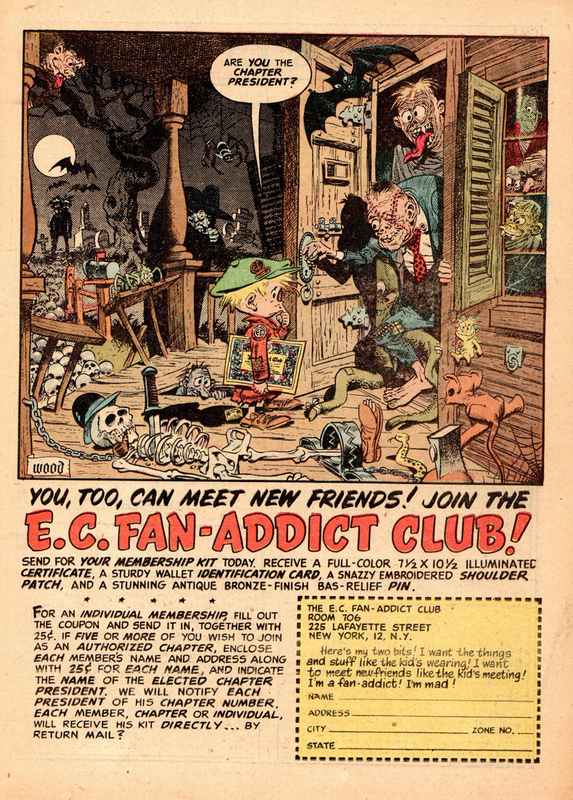 Bhob Stewart, at age 16, developed the first fanzine strictly devoted to EC Comics in 1953. From that, Gaines was given the idea to do the bulletin (which Stewart also chartered) and the fan club. At this same time, Russ Cochran was sending in his quarter to become a Fan-Addict, after getting thoroughly hooked on the comics. While these things may seem like tangential facts, they laid the groundwork for EC publishing for the next fifty years. If these young men had not had a strong comic book fan community that supported them and introduced them to other “like minds,” it is unclear whether their input on the future of EC Comics would have been so robust. In the annals of comic book history, the amount of times EC Comics has published and then republished the exact same materials is fairly unusual. In fact, the title-to-republication ratio for this company is rather unique. EC did not have longevity on its side, nor did it have an exceptional amount of elements to work with, but one might think that continuing to try to “cash in” on these same assets would prove fruitless at some point. History has shown this not to be the case, and the explanation for this aberration has more to do with the fact that certain aspects of the collector mentality are in complete alignment with preservation/archival ideology than not. Updates on each subsequent republication over the years have focused almost entirely on the desire of the collector/consumer and adding value to their goods. This can mean anything from encompassing more supplemental materials and reprinting on better paper to the distribution of new volumes whenever the technology changes as far as inks and color guides are concerned. For comic collectors and fans, many are completest: they want to have everything. While this kind of collecting is expensive when it comes to a company like EC that keeps printing and reprinting new books all the time, they have also guaranteed that you will not get the same thing twice. With each new release, you are building a library (or archive!) of your own. What has been created by the multiplicity of works available, in all the different versions and formats (color/black-and-white, hardbound/softback, etc.) is a method of preserving the actual materials that would otherwise have been left to molder away after one re-pressing. In 1968, after the Ballantine Books publications, Bill Gaines joined forces with Bhob Stewart and Ron Barlow, two of his “fan-addicts,” to produce a more comprehensive reproduction of the works. The EC Horror Library of the 1950’s was published in 1971 by Nostalgia Press, and was intended to do more than revisit the materials, per the Ballantine pressings. They were done with the fans and collectors in mind. These books were reproduced on heavier paper, and hardbound with a folio signature. These full-color books followed the color guides of the original colorist, Marie Severin, and “intersperse[d] brief artist biographies, letter pages and house ads among over 20 classic EC horror tales, representing all the great artists (including young Frank Frazetta, an occasional EC contributor).” (Salkowitz 2012) The stories in the tome had been selected by Bhob and Ron, as representatives of the EC fan community, an essential EC characteristic, harkening back to the days of the EC Fan-Addict Club Bulletin when readers were solicited for comments on currently running comics and ideas for new stories. Shortly after this, Russ Cochran published the first of what was to be many different EC Comics reproductions. The EC Portfolios were released between 1971 and 1977. These oversized comics, larger in page size than later hardcover editions, were printed on high-quality heavy stock paper. They had black and white graphics, but included full color covers. The portfolios are widely considered to be some of the best of all the various reprints that have been published from the EC titles, due to their larger size. As Russ Cochran tells it, he really couldn’t see any other way to print them except big. It’s what the art deserved. He was visiting Bill Gaines one day when he saw the original art that had been used to create the EC Horror Library of the 1950’s volume, and that’s when it occurred to him. He had never seen the original EC art, and what he saw was that, unlike what had been published in the Ballantine publications or the Nostalgia Press works, it was very detailed. At the time of this visit, Cochran was simply a fan and a collector. But as such, he knew what the people wanted, what they required. Cochran would spend the rest of his life making sure fans and collectors remained happy with their product. While Cochran did provide the marketplace with a plethora of reprints over the years, including pairing up with other publishers such as Gemstone and Gladstone, there are three main examples of the modern EC works that shine when it comes to the discourse of re-production as preservation. The first is The Complete EC Library, published by Russ Cochran, shortly after the end of the Portfolio run. True to its name, it was, indeed, complete, including every title in the EC library and ran from the late 1970’s through the 1980’s. Each title was published as a 9”x12” volume and came as a set, with its own collectible slipcase. The publication itself attempted to improve upon the Portfolio series in its more exhaustive content and hardbound encasements. These volumes were printed from negatives made from the original artists’ work, and were chiefly in black-and-white, although they included color covers. A further supplemental feature of the EC Library was commentaries and annotations from a variety of comic book professionals, including Bhob Stewart! Although the publication of the Archives was interrupted at one point due to cash flow, it was resumed and all the titles were done sequentially and chronologically (proper archival form!). This may have been done before, but never in a hardbound curated edition with so much attention paid to the quality of the work. Additionally, the supplemental features included original ads, editorials and letters pages, like the original Nostalgia Press volumes. They included commentaries with well-known horror “authorities,” and, while at 11”x8.5” they were slightly smaller than the EC Library; they were still larger than the comic books. The EC Archives are an eloquent example of the way in which digital technology has added to the world of the tangible, material comic book resource. These materials utilized primary source materials (Marie Severin’s color guides, original art) in tandem with newer resources to produce editions that were actually enriching the EC Comics library. While the EC Archives may not have been a restoration, they were true to the texts that were originally created. This was not colorizing a black-and-white film, this was utilizing computer technology to match Marie Severin’s original color scheme. The process may have been more synthetic than previous attempts, but its core was based upon the premise that the original comics were in color. If there was a way to make these editions look as beautiful as possible, in color, without losing visual fidelity, let’s upgrade! The final publications that have shaken the EC library from its very foundation were announced in July 2011 at San Diego Comic-Con International. Both follow a similar method of singling out writers and artists from the EC Comics community and repackaging them according to their individual works. Publishers IDW and Fantagraphics, in separate publicity statements, discussed plans to begin publishing what appear to be very carefully curated editions of EC materials in formats that have not yet been done before, a rarity within a catalog that has been published and republished. IDW’s Artist Edition series is not exclusive to the works of EC, however out of the two publications, it appears to be the one that will be most valuable to the EC library on a preservation level. Preservation can take various forms within different communities. For the comic book community, it is generally focused within the collecting and fan population. From the responses of fans and publishers alike, it seems that they are all aware of the work that they are doing on a technical basis (grab a fan and it’s frightening how many times they can tell you the precise paper type a comic was printed on, what year and what company used it) and yet none are really conscious of the kind of protection they are providing for the work when it comes to future access when they properly house them within a collection. They express archival language through the dialogue of consumerism and collecting hierarchies. According to comic book collectors, the “best” elements are the materials that have been cared for correctly and stored in the proper manner. The worst pieces are those that have been left to suffer whatever the hands of fate might have dealt out. The various comic book grading scales bare a striking resemblance to many archival material-grading systems. Cochran’s addition to this was the ideology of re-production as preservation. As a fan and collector himself, he was not satisfied with just one edition. Upgrading the materials not only introduced the comics to new audiences, it guaranteed the library life, as it meant that the works were always being discussed, accessed, and reprinted, even up until today. IGW and Fantagraphics took that idea and ran with it, updating it to the current buying habits of the reading public. Overall, the multiplicity of reprints under the EC umbrella has guaranteed that a fairly small company with fewer titles than most (excluding MAD Magazine) is still making headlines in the comic book news. This method of multiple publications has, effectively, eradicated the need for an archive on a central level as it has shifted the archive concept and made the materials available on a wider scope. While the vast readership may not have the primary elements in their hands, they have been given, over the last 60 years, the full EC library. Additionally, it has been proven that there are multiple concerned parties who will watch over the elements and make certain that they always receive the attention that they deserve. The community that Gaines worked hard to build during the EC years has clearly lasted until today and appears to (likely) have a future with the horror comics fans of tomorrow. Cochran, Russ. “The Digital Comic Museum Forum.” Digital Comics Museum. September 04, 2011. http://digitalcomicmuseum.com/forum/index.php?topic=2844.0 (accessed June 11, 2012). Cochran, Russ, and Grant Geissman. “Interview with Russ Cochran.” In Tales of Terror: The EC Companion, by Grant Geissman and Fred Bernewitz Von. Fantagraphics, 2002. Feldstein, Al, interview by Jon McClure. Al Feldstein Interview Edited by Jon McClure. Livingston, MT, (April 20, 2010). Gartman, David. “Culture as Class Symbolization or Mass Reification? A Critique of Bourdieu’s Distinction.” American Journal of Sociology (University of Chicago Press) 97, no. 2 (September 1991): 421-447. Grabols, Andrew. “Graphic Novels.” Beneath the Cover. August 20, 2007. http://www.beneaththecover.com/2007/08/20/graphic-novels/ (accessed June 14, 2012). IDW Publishing. IDW Expands Artist’s Edition Series with Wally Wood’s EC Stories. July 20, 2011. http://www.idwpublishing.com/news/article/1885/ (accessed June 11, 2012). Lelak. Crisis on Infinite Comics. 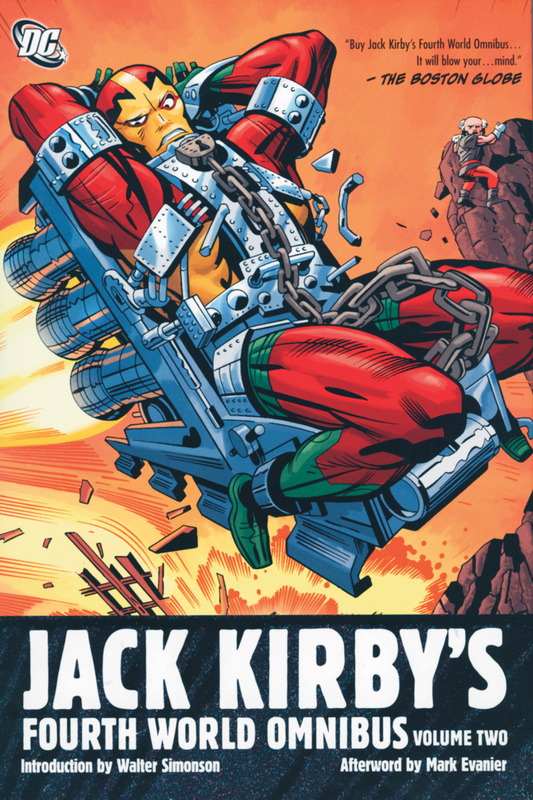 February 02, 2012. http://marvelmasterworksfansite.yuku.com/reply/513985/Next-IDW-Artist-Edition-Wally-Wood-ECs#reply-513985 (accessed June 11, 2012). Moore, Rob. “Cultural Capital: Objective Probability and the Cultural Arbitrary.” British Journal of Sociology of Education (Taylor & Francis, Ltd.) 25, no. 4 (September 2004): 445-456. Royer, George, Beth Nettels, and William Asprey. “Active Readership: The Case of the American Comics Reader.” In Everyday Information: The Evolution of Information Seeking in America, by William Asprey and Barbara M. Hayes, 277-305. Cambridge, MA: MIT Press, 2011. Salkowitz, Rob. The EC Horror Library of the 1950s . 2012. http://www.atomicavenue.com/atomic/titledetail.aspx?TitleID=18768 (accessed june 11, 2012). Schudson, Ariel. Survey on Comic Book Preservation and Storage. Survey, Los Angeles: Surveymonkey, 2012.
sfcityduck. Crisis on Infinite Comics. 01 19, 2012. http://marvelmasterworksfansite.yuku.com/reply/509162/EC-News-or-Comments#reply-509162 (accessed June 11, 2012). This entry was posted on June 18, 2012 by sinaphile in Access and tagged Academia, Al Feldstein, Archiving, Bill Gaines, comic fan polls, Comic Fandom, EC Archives, EC Comics, EC Fan Addict Club, EC Portfolios, mylar bags, Preservation, preservation polls, Russ Cochran, Tales from the Crypt, Wally Wood.